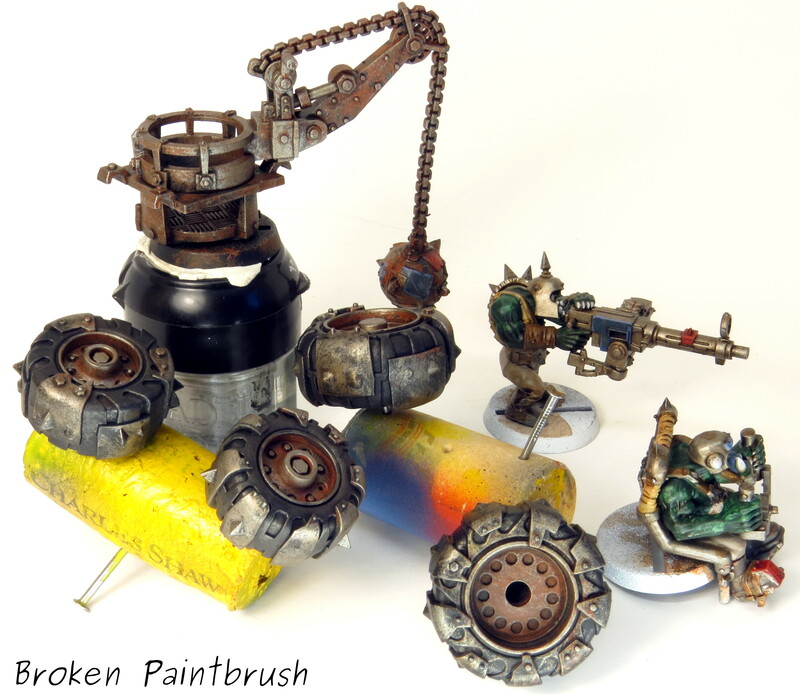 Over the years I have been painting, I love coming across a tutorial on something I haven’t done yet and gleaning just a little bit of information off of it. So here is my second how-to of the year – following up on my Ork Warboss – and a chance to give a little something back t0 the community. 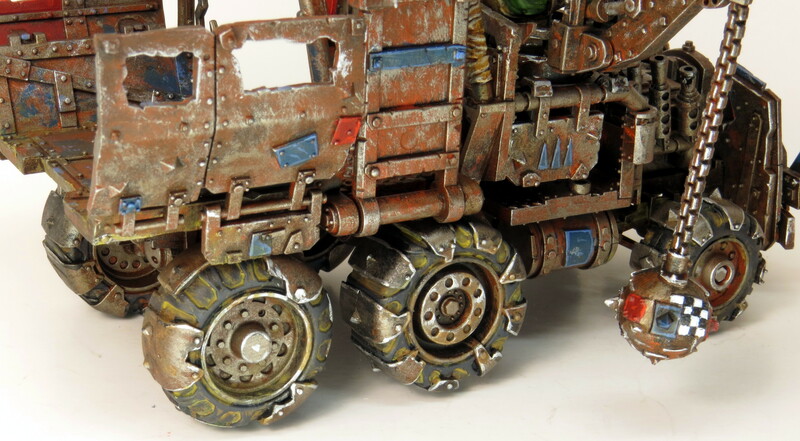 I have another tutorial on the rest of the Trukk, but here I want to focus on the wheels. As you can see below, I kept the wheels, crew, and wrecking ball separate from the main truck body to make it easier to paint. 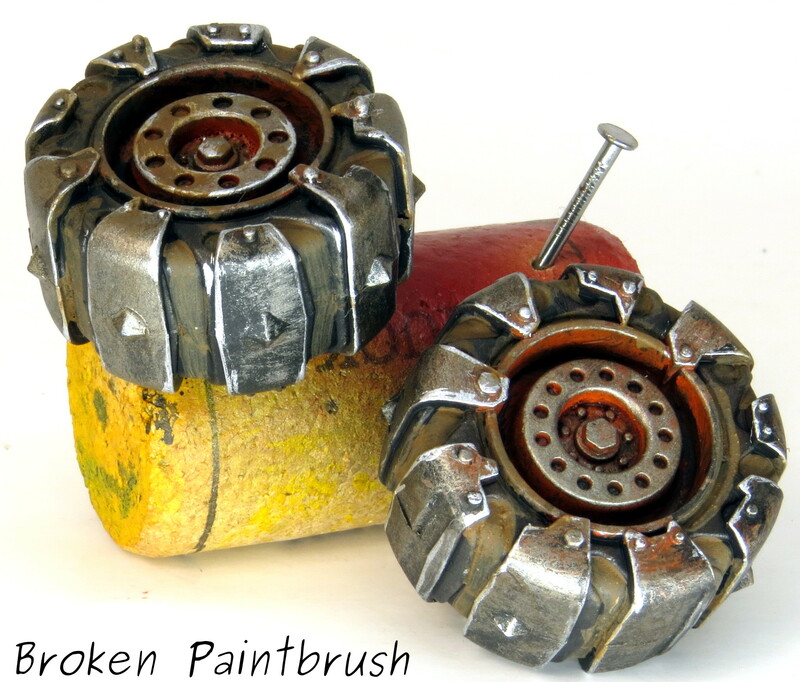 The crew and wrecking ball were lightly glued to scrap bases, and I found the wheels hubs were the perfect fit for the penny nails I use for pinning. 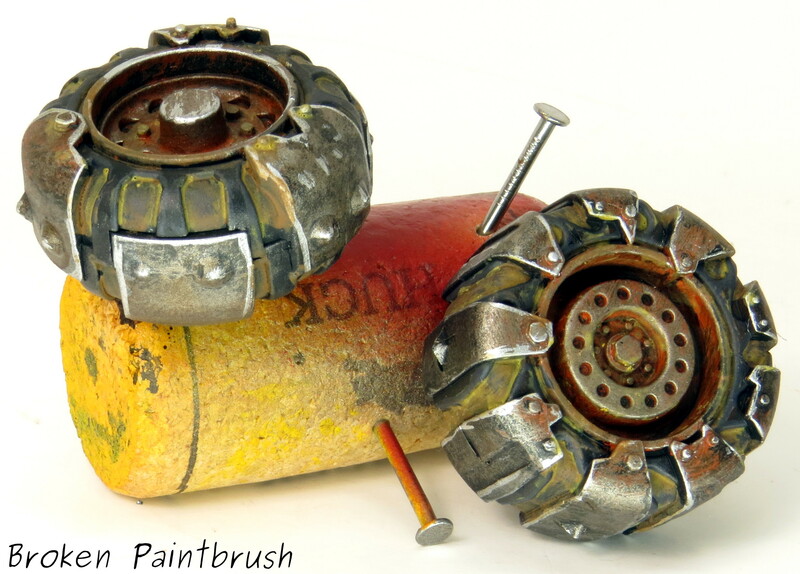 Using some old corks I could paint the wheels and allow them to dry without touching any painted surface. 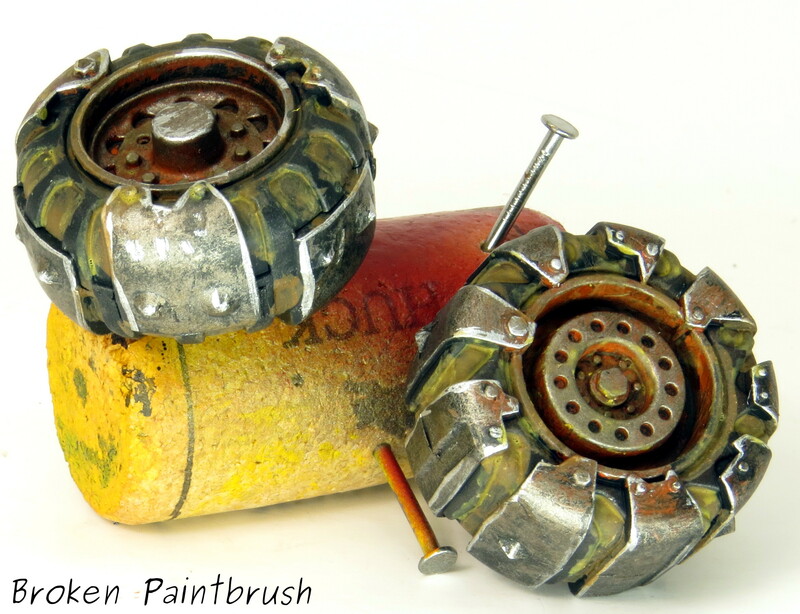 The wheel was left black from the primer, and all the metal areas were coated with Leadbelcher. Ryza rust was liberally applied to the hub. I followed this with a dry brush of Rune Fang and a final wash of Earthshade. I wanted the tires to be dusty, but not full on muddy, so I washed the inner treads with Skrag Brown mixed with various weather powders. The idea was to get the darker brown down first. I wasn’t too careful about keeping it off the tire surface at this point. Using thin downed Zandri Dust mixed with lighter colored powders, I washed the recesses of the treads. While this may seem backward to wash the crevices with the lighter color, looking at dusty, dried mud-filled tires, the recesses kept most of the lighter colors. The tires were then touched up with Dawnstone and even dry brushed in the middle of the treads. This helped to ‘wear’ down the dust in the center of the grooves where it might have been knocked out. After attaching the wheels to the main truck, you can see how the metals tie back together, and the dark tires give a good contrast to the main metal body. anytime soon. I would always appreciate feedback below and any suggestions on improving my articles.